What is the paint brand for the cyan? - Manufacturer and color of cyan on stripped wall? Perfectly painted stripes1. Paint the lighter color as a base coat. Allow to dry completely, then use painter's tape to mark off the stripes for the darker color. 2. Before tackling the stripes, do one more layer of the lighter color along the seams of the tape. This fills the gaps so that the darker color won't bleed. 3. Wait for that layer to dry completely, then paint your stripes. Let dry again before pulling off the tape. DIY secret: Perfectly painted stripes. How to get your stripes right, with no bleeding color:1. Paint the lighter color as a base coat. 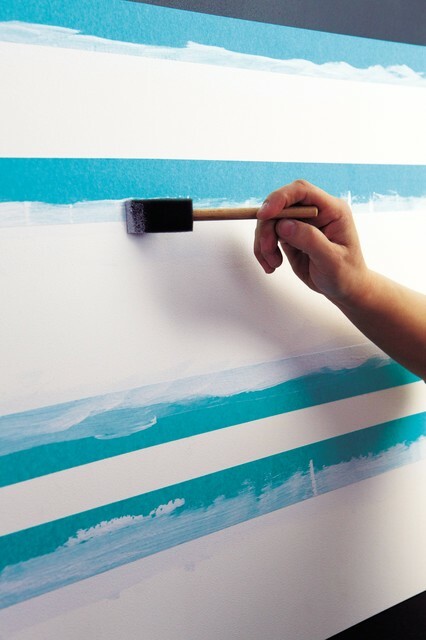 Allow to dry completely, then use painter's tape to mark off the stripes for the darker color. 2. Before tackling the stripes, do one more layer of the lighter color along the seams of the tape. This fills the gaps so that the darker color won't bleed. 3. Wait for that layer to dry completely, then paint your stripes. Let dry again before pulling off the tape. When painting strips, paint the base color first, once dried, lay down the blue tape and paint the base color again to avoid any paint seeping under the tape, once dried paint the stipe color, then once dried remove the tape. Paint the light color for a striped wall first. then tape it. Then paint along the tape another coat of the light color. Let dry completely. Finally, paint the dark second color. Let dry, and then peel off the tape. After marking with painter's tape, run finger along tape to make sure there are no air pockets. Paint wall paint along top & bottom of painters tape for your stripe (prevents bleeding). Let dry before painting the color stripe you desire. Clever way to prevent bleeding when painting stripes - tape off, paint one more coat of base coat along the seams of the tape. This fills in the gaps so the stripe color won't bleed. Let dry completely, then paint stripe color on top, and let dry completely again, before removing tape. DIY secret: Perfectly painted stripes. How to get your stripes right, with no bleeding color: 1. Paint the lighter color as a base coat. Allow to dry completely, then use painter's tape to mark off the stripes for the darker color. 2. Before tackling the stripes, do one more layer of the lighter color along the seams of the tape. This fills the gaps so that the darker color won't bleed. 3. Wait for that layer to dry completely, then paint your stripes. Let dry again before pulling off the tape.